Description: An look at several compositional strategies including repetition, balance, color relationships, focal points, using odd numbers, and the "mirror test". A loose watercolor still life sketch is started in this module. Suggested Materials: 140 lb. Cold press watercolor paper, HB graphite pencil, Kneaded eraser, watercolor paints (Prussian Blue, Ultramarine, Cadmium Yellow Hue, Alizarin Crimson, Cadmium Red Pale Hue, Yellow Ochre, and Burnt Umber), nylon brush, mixing palette. *Cotman tube watercolor paints are used. Thanks for making us aware of this issue. We are working to resolve the problem as quickly as possible. Thank you Matt. I do want to say you are the best. HOW DO YOU DO THAT??? If I try to use so many wet colours I end up with mud! Guess I just keep trying til I get the magic! Thank you so much for your course I find your way of teaching really good. My question is can you use Atelier Interactive paints as watercolour in this way? I would love to try the watercolour techniques but did not want to buy more paint in case I don’t like it. Also I have a pad of 100lb water colour paper which I haven’t used yet will it work ok with this? Unfortunately, I don’t have any experience with the Atelier paints so I can’t offer a suggestion there, but I would suggest using a heavy watercolor paper. 100 lb. paper will likely buckle. I would stick with at least 140 lb. to avoid much buckling. Great video – I learned a lot. seems to get “clean” on occasion but I am not sure how? I am wondering if a person could sketch out their still life with watercolour pencil versus using graphite. In my mind, this would eliminate the graphite lines. What is your opinion on this? I just finished module 6 and pears look like a 4 year old did this. I’m hoping that in module 7 it’s going to look better with practice. I’m hoping it will become much better over time. Also do you clean your brush after each application of paint? My first attempt at water color. Lesson 5 beginning of the pears. 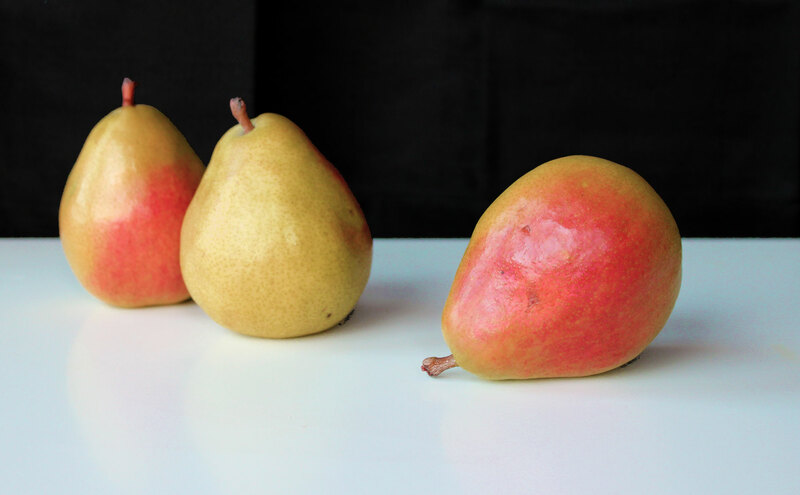 I must say my pears do not look like your examples. I have mud looking / rotten pears. On to the next lesson in hopes these can be made to appear better. One small request: Would it be possible to include an option for closed captioning?